I had the pleasure of addressing fellow practitioners today at a Legalwise Seminar on the topic of Environmental due diligence in corporate and project transactions. Environmental lawyers are frequently called upon to assist with due diligence projects, but the law and risk landscape for environmental liability in Australia is fast-changing and complex. I loved sharing my insight and practical perspective on the key issues that are emerging in transactions. My presentation provides a conceptual framework for tackling legal due diligence projects, including some of the key considerations on which to seek initial instructions, such as briefing environmental consultants. Forewarned is forearmed. Knowledge is power. Key trends include continued M&A in the renewables and waste sector, including resource recovery and energy from waste. There is a greater need and willingness of practitioners to focus on a triple bottom line approach, and ensure that clients get the best possible advice by engaging expert environmental consultants to advise on risks. UPSS/USTs remain a complex area, both as a potential source for compliance risk and contamination risk and also frequently due to complex arrangements of ownership and management of assets. Grid connections and transmission corridors remain a big consideration in solar and wind generation development, and can lead to complex approvals dd being necessary over large areas of land. Other land-related issues include questions of concurrent mining or exploration titles over generation sites and how to reconcile competing interests. NGER compliance is one to watch, in the context of market consolidations and aggregation of emissions and energy data in the group structure post-acquisition. If you or your firm or a client needs assistance with due diligence, please contact me and I can provide support on your deal. Please refer to my service model for some of the options for on-boarding me into your advisory team. To download an abridged version of the presentation click on the image below. I addressed the the Australian Environment Business Network’s National Conference this week, and to prepare I’ve immersed myself in 7 Australian jurisdictions (NSW, QLD, WA, TAS, ACT, NT and CTH) to see what’s on the agenda for environmental law reform in 2019 and reviewed the notable recent changes. Almost every jurisdiction is changing laws and developing policy in the waste space. Significant policies include the National Waste Policy of December 2018; NSW’s 20 Year Waste Strategy; and WA’s Waste Avoidance and Resource Recovery Strategy 2030. 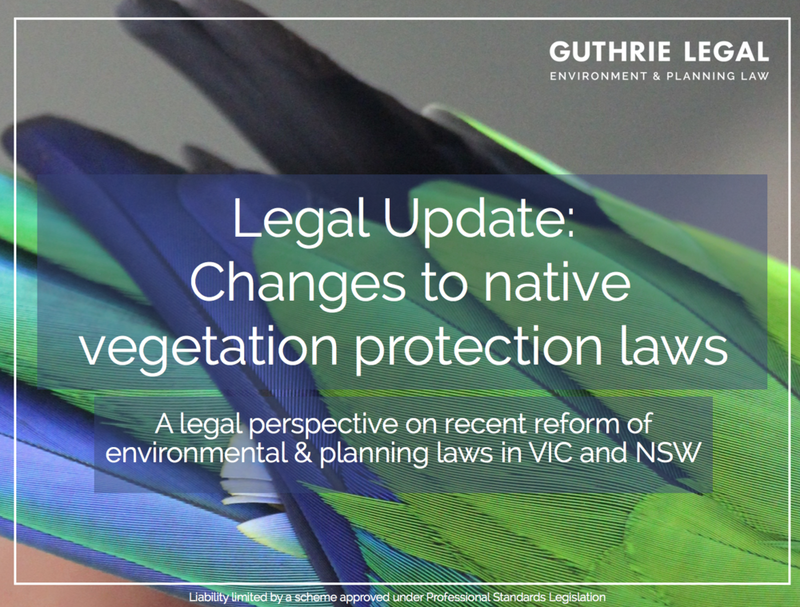 There is also a raft of notable changes to technical requirements, for example, the 25 January 2019 changes brought about by Protection of the Environment Operations Amendment (Asbestos Waste) Act2018 in NSW, or QLD’s new waste classifications, end of waste codes, ERA and amended waste levy. Waste to energy / energy from waste is also a key theme, with a report from the Clean Energy Finance Corporation finding NSW, VIC, SA, ACT and WA among the most favourable jurisdictions for such facilities, and WA having 4 approved waste to energy facilities already. New climate policy is planned in WA in 2019 and Tasmania’s Climate Change (State Action) Act 2008 is to be amended. But the big news in the legal world is the recent 2019 NSW case of Gloucester Resources Limited v Minister for Planning  NSWLEC 9. Among the reasons for refusal of a new open cut coal mine, CJ Preston of the NSW Land and Environment Court found that “the GHG emissions of the coal mine and its coal product will increase global total concentrations of GHGs at a time when what is now urgently needed, in order to meet generally agreed climate targets, is a rapid and deep decrease in GHG emissions. These dire consequences should be avoided. The Project should be refused.” Legal commentators speculate that the approach in Gloucester could be adopted in other jurisdictions. On water, WA proposes a new Water Resources Management Act to consolidate 6 current Acts, the NT proposes a Water Amendment Bill 2019 – under consultation until 11 March 2019, and in NSW we have seen the passage of the Water Management Amendment Act 2018. Whatever the nature of your organisation and the relevance of waste, climate and water reform, one topic is inescapable: the continuing trend in environmental enforcement. Penalties are increasing in 2019** and regulators are consistently reporting on enforcement action that grows in sophistication. Environmental regulators that may have been pre-occupied with administrative changes to their departments (such as the change from DEHP to DES, or DER to DEWR in 2017 and 2018) are now externally focussed. DES in QLD recorded its highest ever fine in a prosecution of Linc Energy Limited ($4.5 million) for five offences of wilfully and unlawfully causing serious environmental harm, over a period of seven years, in contravention of the Environmental Protection Act1994. Convictions were also recorded against the company. 2018 also saw the adoption by EPA NSW of a new policy on Monetary Benefit Orders. Monetary benefits are the financial advantage an offender gains over their compliant competitors who have done the right thing. It signifies that EPA NSW are likely to commence seeking such orders during environmental enforcement. The key governance requirement for directors and senior environmental managers is to exercise due diligence. In a nutshell, this means understanding the organisation’s legal compliance requirements and putting in place systems that ensure compliance. Understanding legal changes is important. But I also know from my January 2019 client survey that many of the priority issues for clients arise from complex ongoing issues such as contamination liability, underground storage tanks, licence requirements and vegetation management. These are not necessarily matters for reform in 2019 (depending on jurisdiction) but they are of fundamental importance. Take time to have a conversation with your team and advisers about the status of your environmental registers, whether 2019 reform will impact you, and how existing sites and operations are being managed. Please get in touch or book me for a tailored fixed fee briefing if you would like a more detailed perspective on the changes or how they may affect you. *reform of environmental laws in Australia occurs frequently and across multiple Acts and Regulations in each State and Territory. I have distilled the significant changes from the last 6 months and looked at consultation and legal changes proposed in 2019. There are several changes that don’t fall into these 4 themes, so always make sure you monitor applicable legislation. Scope: whilst pollution incident response is the critical piece from a compliance perspective, there are other environmental laws requiring self-reporting of breaches on the statute books, notably in the petroleum, gas, and mining space, but also in relation to biodiversity and heritage matters. Determining an appropriate scope for your environmental incident notification protocol is essential to ensure that personnel report issues within your organisation appropriately, given your activities. Get in touch if you would like to discuss environmental incident management for your organisation. Clarity and confidence in environmental legal risk management is so important. It was a great pleasure to co-host, with Lotte Hoekstra from AECOM, the Australian Environment Business Network's 2018 update on changes to environmental and planning laws around Australia. I spoke about some key risk management trends for 2018 and highlighted recent and upcoming areas for reform across the States and Territories. site decommissioning and mine rehabilitation. For an abridged version of my talk, click on the image below. If you missed today's session and would like a tailored briefing for your organisation, please contact me. Environmental incidents such as pollution events and unlicensed discharges are major regulatory risk creators. On 11 May 2017, I shared some of my first-hand experience dealing with the legal issues arising from environmental incidents to Australian Environment Business Network members at the AEBN Emergency Planning and Response to Incidents Workshop. If your organisation's operations have any activities that could give rise to a pollution incident, it is essential to have an emergency response protocol tailored to the things that might go wrong in your specific operations. It won’t turn back time. But it will ensure that you deal with incidents in the best possible way. Swiftly, lawfully, and minimising your liability and reputational risk. Click on the below image for an abridged summary of my presentation outlining the various incident notification requirements across Australia and check out my tips below. Note: the summary is content-rich, but don't be put off! I offer fixed fee tailored briefings on this and other topics, so you can be guaranteed of a clear understanding of your risks. Get in touch for more information. Create, update and implement an incident response protocol (legal requirement in NSW, ACT and SA) but essential in all jurisdictions for effective risk management. Make sure that relevant personnel understand what constitutes an “incident”, who is to be notified internally and identify who is responsible for making any external notifications to regulators. Seek legal advice promptly after an incident comes to your attention in order to manage liability (including the identification of offences and any relevant defences) and make legal notifications as necessary. Be mindful that some legal defences, such as emergency defences, are only available for a short time after an incident. You might not be able to invoke a defence if you delay in seeking advice. Note that environmental incidents can lead to criminal offences and licence breaches, and will often trigger legal notification requirements. Some of the highest fines under environmental laws in Australia (up to $2 million in NSW) are for failing to report pollution incidents to regulators. Don’t get too caught up in “classifying” an incident internally. Whilst it might be helpful in some cases to direct internal reporting and management, the bottom line is that a legal assessment needs to be made about the nature of the incident, any potential offences, and specific notification requirements. Want to know more about key risk issues in 2017? Read Environment Express 2017 on my Ideas & Events page. For more information about the detailed compliance requirements for incident notification; practical insight based on first-hand experience; preparation of pollution incident response plans; and applicable penalties, please don't hesitate to contact me. Sign up with your name and email address to receive environment and planning law updates and latest legal thinking straight to your inbox.